This is a description of the architectural details of the typical Victorian or Edwardian hall, landing and staircase; the plaster, woodwork including floor, skirting, dado, and doors, and the staircase, and the windows. 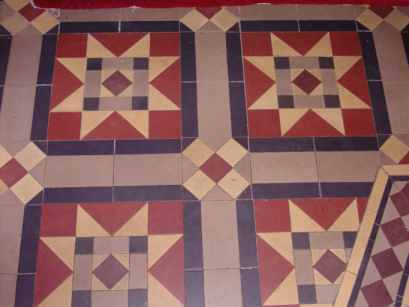 The floor was usually tiled, perhaps with a mix of encaustic and geometric tiles, wooden with boards painted dark brown. In a few cases, the floor might be a marble mosaic, terrazzo, or a granolithic style. There was often stained glass in the windows overlooking neighbouring houses. This allowed light onto a landing but gave privacy and hid the backs of these other houses. Staircases can be straight, or with a quarter or half turn. Larger houses might have had a dog-leg or open-well layout. The newel posts and balusters were normally in wood, but sometimes that were made from cast iron. Wooden balusters were usually turned, but in the late 19th and early 20th centuries, fretwork designs were popular. The Arts and Crafts movement led to more plain designs too. The commonest original section was a square, with the turned element being round. The shoulders of the square elements were typically a simple curve or an ogee. The main length of the post is derived from the use of a single pattern, although this was often repeated two or three times. For example, a straight taper was common, but there may be three tapered sections. Other patterns were reeding, flutes, and spirals. Major decorative details were provide by the third element. This might be an acorn shape, a short bellied or tear-drop section, or a barrel. Additional embellishments came from astragal ribs, Greek torus or spool shapes, singly or in combination. Additional decoration came from simple grooved rings, often in combinations, on the larger elements. For example a barrel might have had three grooves at the widest point. Similar profiles but in square-cut designs became more common in the Edwardian period as mechanisation made them more affordable. 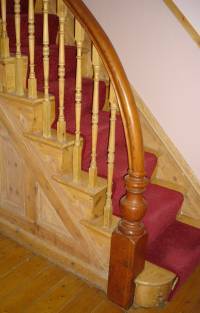 In this unusual Edwardian design, the hand rail curves down and becomes the newel posts. Perhaps this appealed to a bannister-sliding owner. Two conflicting fashions can be seen. In more affluent homes, the trend towards the end of the 19th century and into the 20th was for increasing simplicity, whilst increasing mechanisation brought the price of fancy woodwork into the reach of less wealthy people. As with the doors in Victorian and Edwardian houses, where the wood is pine it was painted or perhaps grained. If the wood was of higher quality, it was just polished. Thus you might find a hardwood rail, and painted pine newels, balusters and other components. The newel might instead be mahogany or another finer wood. The skirting may be moulded or else constructed from staff bead on plain boards; this can be bent at the bottom and top of the stairs. 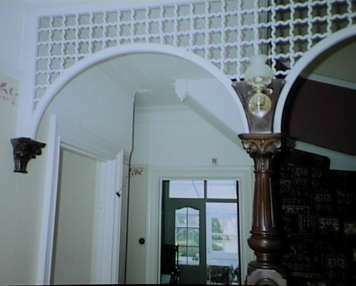 In some late Victorian and Edwardian houses there would be some form of fretwork or turned wood screen, like an elaborate arch, with drapery at the bottom of the stairs. For companies selling original and reproduction floor tiles, see the Products and Services Directory.